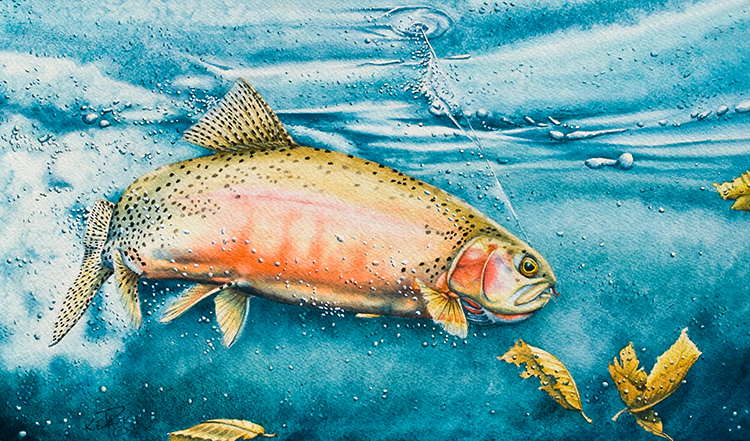 We would like to introduce Kevin Pack, our featured artist who has been heavily involved in the fishing world since growing up in California. A:I currently live in Ramona, California. I started working on the Daily Double out of H&M Landing at the ripe age of 14 riding my bike from Chula Vista to the landing at Scott street, I worked on different boats off and on as school permitted until I joined the Navy in 1975. A:Primarily in watercolor, occasionally Pencil and a lot of Photography. I also do all my own matting and framing as well as having a small framing shop for other peoples work. Q:What is your favorite medium? A:Transparent Watercolor I also do a little work in pencil and pen and ink. 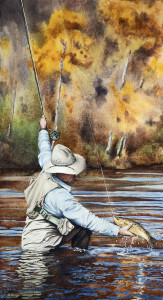 A:My hobbies are fly-fishing, fishing, scuba diving and hunting and yes they relate to my artwork, every time I am fishing or hunting, the opportunities which are getting fewer and fewer these days due to my schedule, I am watching and recording everything going on around me so that some aspect of that trip ends up encompassed into a future painting. 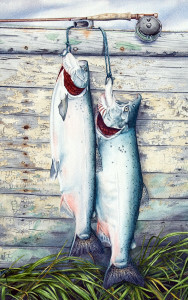 I have spent my entire life in the outdoors and I use all of the encounters and experiences to draw from for my art. Something that is a part of my art and my life is photography, it as much a job as it is a passion, I use it for my reference as well as my enjoyment. 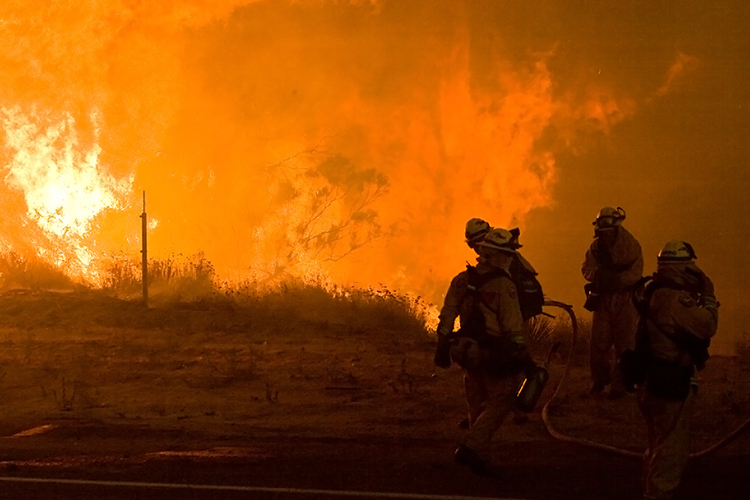 One of my biggest, I guess you can call a hobby, but it really is a side job is wildland fire photography, I work with Cal-Fire as a photographer for wildland fires and accidents, I have being doing that for a little over 9 years. I photograph major events around the San Diego/ Riverside area as my schedule permits. It is another way I see as giving back. A:Do you have a long time and a lot of space? I got my start because of an industrial accident. I was a heavy equipment operator, and a good one, I was injured very severely in an accident on a jobsite. It was so bad it put me into physical therapy 4-5 hrs. a day for 4 ½ years. That is when I started teaching myself how to draw and paint, I needed it for mental therapy. I never thought that I would end up as an artist it was just to ease my mind from what I was put through in physical therapy. At some point I was informed that I could no longer work in construction the injury had been too devastating and I would be retrained as a CPA, nothing against CPA’s but that is not a job I would want to do. In the first year I did six shows I did not sell a single painting until my very last show, I was so close to giving up it was not funny I needed to make a living and I was so unsure of the path that I had chosen that my career almost ended before it got started. That was 20 years ago, I am still at it today. My style comes from trial and error; I want to recreate what I see and how I see it. As I have learned more and more my style evolved to reflect that acquired knowledge. Q:Have you had any formal training? A:No formal training at all, all that I have learned has come from trial and error and a lot of reading. It took almost a year to just learn how to draw, in fact when I first started I tried to paint and draw at the same time, I would not recommend this as an accepted method, drawing is the foundation and without the foundation the rest collapses. Here is a little secret for the first six years of my career if the color I wanted did not already come in a tube I did not know how to mix it. I did not know what a cool tone versus a warm tone was nor did I know anything about perspective. I only started with watercolor because I thought it would be easy (anything with water is easy….. right) and easy to clean up. A:Let’s start with the future first, who knows what the future holds; I hope that my art will provide a history of what is and enrich the future lives of all who come in contact with it. That through my art I can both educate and enrich the lives of as many people that come into contact with it as mine has been enriched both through the creation of my art and through my photography. As well as enriching and educating all that I encounter and have encountered on this great big blue marble we all call home. I have also started guiding and teaching photography in Yellowstone National Park, I was offered a position with accompany to guide 5 day horseback photography pack trips and jumped on it, it was probably one of the top 5 things I always wanted to do but never thought I would get the chance to. I also want to continue to improve in my craft and keep producing and recording what I see and experience in this big beautiful world. My goals, hmmmmm…. to always get better at what I do is a big one; I have a lot to learn still. I would like to teach a little more than I do, I have been very fortunate and I believe in “pass it on”, so passing along what I have been fortunate in learning is a big goal. That my work will leave an enduring legacy to all that nature is and has been. That it is bigger than all of us and if we just open our eyes and ears it has a lot to teach us and if my art helps to open eyes and ears that is a big plus. A:Yes, open your eyes and ears; don’t just walk with your head down or with blinders on or the music turned up loud in your headphones. Sometimes when we are in pursuit of our goal whether it be a marlin, tuna, trout or bass, or if we are stalking a big buck or hunting a turkey or the next promotion, we are so focused on what is in front of us that we forget to see all that is really going on around us and part of nature/life passes us by. What we missed we cannot get back, we will never know it occurred and it may be just as important as the intended goal. 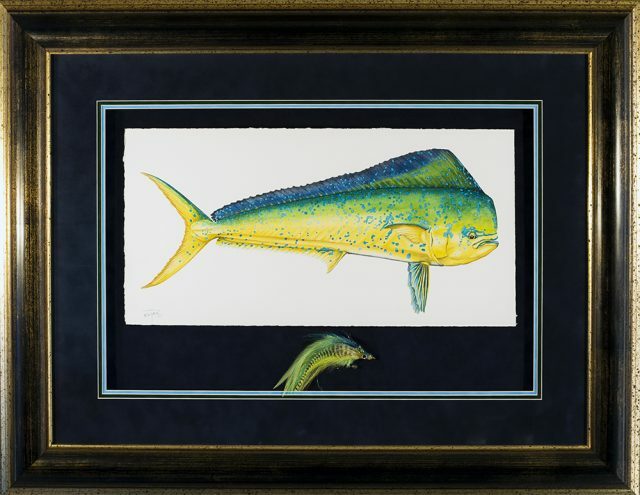 I did a painting of a dorado coming out from beneath a kelp patty to investigate a jig, that painting was inspired by what I witnessed one day trolling for marlin – that dodo came along side our boat and used us to stalk a flying fish it took him three attempts and finally on the third try he got the flyer, as we rounded another kelp patty he cut across and with that flyer still hanging from his mouth tried to eat the short corner jig. If I had been so focused on glassing for marlin I would have missed the whole thing. I also would not have had that memory to create the painting from and yes – the painting sold. A:Yes, nature and the natural world as seen through my eyes and experiences. A:This is tough one, I have many inspirations, in art my biggest is/was probably Stanley Meltzoff, I say is/was because Stanley himself was an inspiration and he passed away a couple of years ago but his art still is an inspiration. 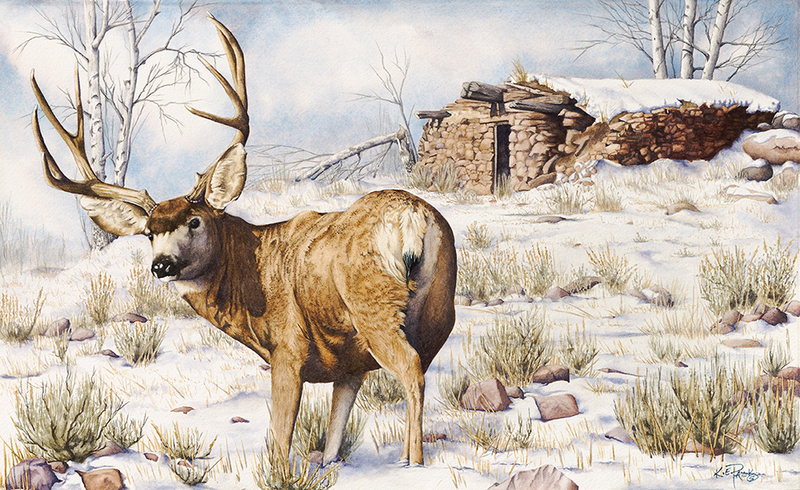 Then there are the wildlife/sporting artists from the mid/late 1800’s most of their work was done in the field. My parents have also been an inspiration, my dad built a 56-foot trimaran by hand, (with a little help from my two brothers and I), as well as helped build two others while working a day job and helping my mom to raise us boys. And my mom who just passed away, she was a self-employed hairdresser while raising 3 boys. She also built a very successful clothing business from the ground up as well, she was the marketing director, the manager, HR, the bookkeeper and the buyer for three very successful retail clothing stores here in San Diego. Unfortunately she went blind from macular degeneration at a relatively early age yet still continued to work for another 10+ years and travel around the world. I also draw a lot of inspiration from our severely wounded vets that are coming home these days, what they have been through and how they have managed with very severe injuries/limitations. It kind of put my injury into perspective, I still have issues with my injury and used to think how tuff I had it, then I see what they have had to go through and how they persevere it humbles me. A:One of the toughest projects was a piece that I did for the IGFA; it was of the IGFA founder Michael Lerner with the first broadbill caught from a dory in the North Atlantic. The reference to work from was a small, maybe 3” x 3” black and white photograph with almost no detail. I needed to take it to a 22 x 30 color painting that was accurate to the period. I spent a year maybe a little longer in research on the clothing and how they fished those waters at that time. Another really toughie was a wedding piece I did for a client, (Yes, I do other than wildlife and fish), it was of his three daughters taken from 42 different photographs taken in three different locations and I combined it into one piece with a very specific pose and added a completely different background. This was particularly difficult because nothing matched, all the reference was different and this was to be the central piece from the wedding as the wedding photographer did not get the shot. As to what is the toughest aspect of my art, keeping it fresh and not allowing myself to get stuck in a rut or become stale, keeping myself challenged, and keeping my collectors happy. 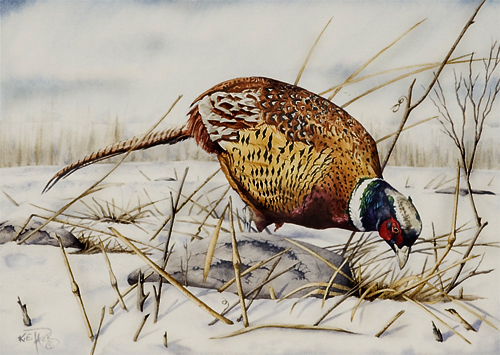 I have so many different subjects between, upland, waterfowl, saltwater, freshwater, fly-fishing, big-game, raptors and songbirds and then the portrait work that I do, trying to keep everybody happy sometimes is a challenge all in itself. A:The most satisfaction is probably the joy when someone finds just the right piece that they have been looking for, or the phone call I get from a client when they receive the commission that they have been waiting for and how happy they are with it, another big one is when I help a new artist or someone who is just getting started and they come back or search me out to let me know how invaluable my help was. The fact that I get to make a living at what I love. Accomplishment, that comes from the happy clients that have been steady collectors for nearly 20 years, from the work that I have done for organizations and states around the country, the fact that people still find my work engaging and collectible. Commissioned by Calif. Department of Fish & game to supply 3 images to be used on the face of the 2007/2008 100th Anniversary Commemorative Hunting License. This is the last paper hunting license to be issued by the State of California. 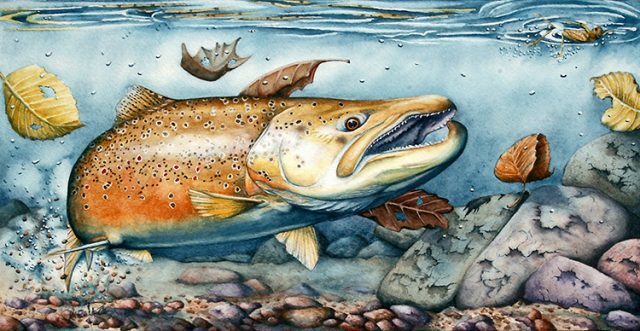 Recognized by The International Game Fish Association for his accurate depictions of early historical fishing scenes, has also been selected for a solo show at the International Game Fish Associations new World Fishing Center’s Gallery of Excellence. First ever artist of the year for the California Rifle and Pistol Association. 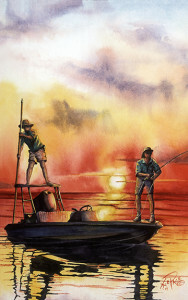 Cover artist for Arizona Game & Fish 2002, regulations. 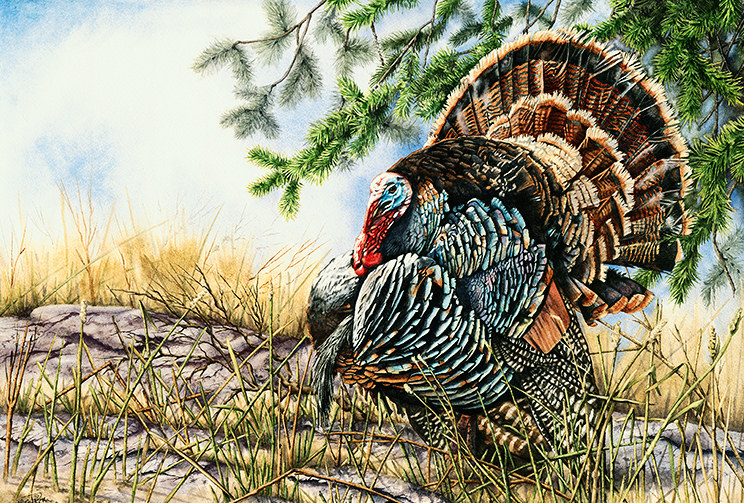 Cover artist for Arizona Fish & Game’s Western Wildlife Magazine with multiple covers and multiple years. 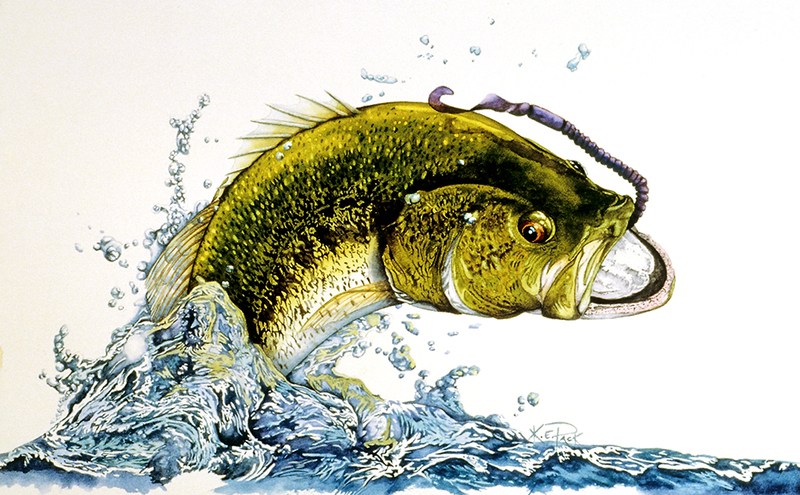 Artwork published in, and had articles written about him in Wildlife Art Magazine (98,00,01 and 02), Informart Art Magazine, (00, 01, 02, 03 and 2004), Redbone Magazine and Saltwater Fly Fishing. Q:Please tell us more about the fire photography. 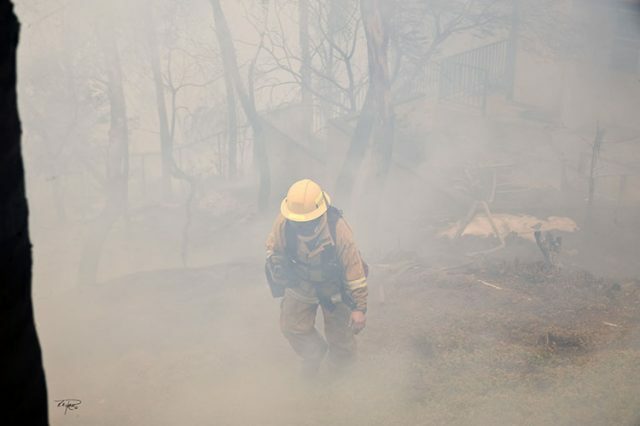 A:I started working with California Department of Forestry and Fire Protection over 9 years ago as a wildland fire photographer documenting fire scenes. 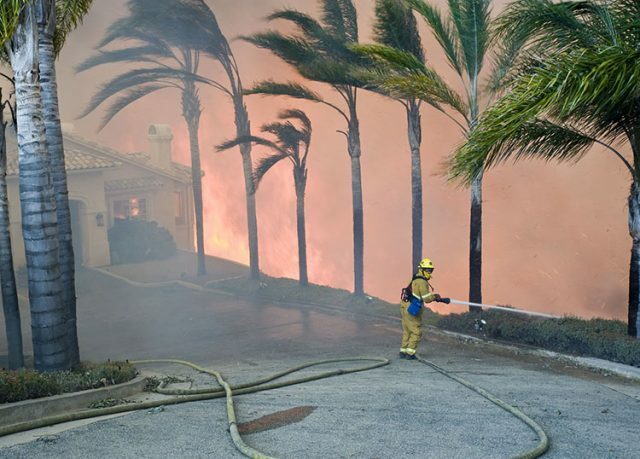 I have been on every major fire in San Diego County since 2008 and some in the L.A. County/Riverside area. Q:What types of media outlets have used your work? Q:Tell us about your involvement in the fishing world. A:I’m a member of the board of the San Diego Oceans Foundation and very active in helping to raise the funding to both start the captive breeding program and bring white seabass back to the coast of California. Was a part of helping to get AB132 passed so that both commercial fisherman and sport fisherman could enjoy white seabass again, was a part of raising funds and working on getting the first ever grow out pens for white seabass approved and in place in San Diego, and helped with numerous grow out facilities up the coast. I was the West Coast representative of the Billfish Foundation for five years as a the main contact on the West Coast for tournaments and clubs for the marine fisheries tagging program and helped write and develop the rules for monied tag and release divisions for billfish tournaments, in fact I oversaw the rules and implementation of them in the first tournament to ever award a cash prize for tag and release in a monied tournament. I was awarded and recognized with a special award from the Billfish foundation partially for this endeavor. The rules as I wrote them are still basically used to this day. Our thanks to Kevin for sharing his talents with us. 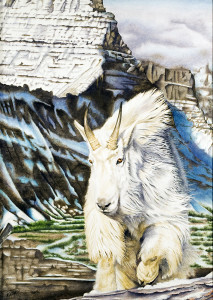 You can check out more of Kevin’s work on his watercolors website or his photography site. Dolphin fishing has been very slow unless you hit just the right spot in the Lower Keys and Key West area.